Publics in most former communist countries generally express low levels of religious commitment. Majorities in the Czech Republic, Russia, Hungary, Bulgaria and the former East Germany say they seldom or never attend religious services, and few say religion is very important in their lives or that they pray at least once a day. Poles are the exception – 45% say they attend religious services weekly. About a third (32%) of Poles also pray at least once a day and about as many (33%) say religion is very important in their lives. Religious commitment is similarly low among Western Europeans – only about a quarter in Germany, Italy and Spain, and somewhat fewer in Britain and France say religion is very important to them. By comparison, a majority of Americans say that religion is very important and that they pray at least once a day. Nearly four-in-ten (38%) say they attend religious services at least once a week. Asked about the role of the church in the political life of their country, majorities in six of the eight Eastern European countries surveyed say the church’s influence is about right. In Poland, however, a majority say the church is playing too great a role in their country’s political life, while half in Bulgaria say religious institutions currently play too small a role. Of the Eastern European publics surveyed, Poles express the highest levels of religious commitment. Onethird of Poles say religion is very important in their lives, and about as many (32%) say they pray at least once a day. Czechs are the least religious of the former communist publics surveyed. Fully 81% in the Czech Republic say religion is not too important (25%) or not at all important (56%) in their lives; just 7% describe religion as very important. Similarly, 82% say they seldom or never attend religious services, and 76% say they never pray. Italians are among the most religious Western European publics – about a quarter (24%) considers religion to be very important. Three-in-ten say they pray at least once a day and about as many (29%) attend religious services at least weekly. Among the French, the least religious of the Western publics surveyed, just 13% say religion is very important; 63% say it is not too important (27%) or not at all important (36%) in their lives. Sixin- ten in France seldom or rarely attend religious services, while 62% say they never pray. Nearly three-in-ten (28%) in former West Germany say religion is very important in their lives, compared with just 13% in former East Germany. A quarter of west Germans say they pray at least once a day. In the east, 9% say they pray at least once a day, while two-thirds (66%) say they never pray. Among the 14 countries surveyed, Americans place the most importance on religion and are the most likely to say they pray at least daily; 55% say religion is very important in their lives, and the same percentage say they pray daily. However, somewhat more Poles than Americans say they attend religious services, aside from weddings and funerals, at least once a week (45% vs. 38%). In most countries surveyed, women are much more devout than men. For example, in Slovakia, 28% of women say that religion is very important in their lives, compared with 10% of men; in addition, more than twice as many women as men report that they pray daily (36% vs. 16%). The gender gap in church attendance is smaller but still significant – 34% of women say they attend religious services at least weekly, compared with 22% of men. In Poland, 41% of women say religion is very important in their lives, compared with 24% of men. Similarly, more Polish women than men say that they attend religious services at least once a week (54% vs. 35%) and that they pray at least once a day (40% vs. 24%). Older respondents also are generally more likely to say religion is very important to them and to say they pray and attend religious services often. Among Poles, 70% of those 65 and older say they attend weekly religious services, 64% say religion is very important to them and 57% report that they pray daily. By comparison, just 29% of Poles under 30 say they attend religious services every week, 16% consider religion to be very important and 15% say they pray at least once a day. Even in the Czech Republic, where respondents in all age groups express low levels of religious commitment, there are sizable age differences. Nearly four-in-ten (37%) of those 65 and older say religion is not at all important to them, compared with 67% of those under 30. 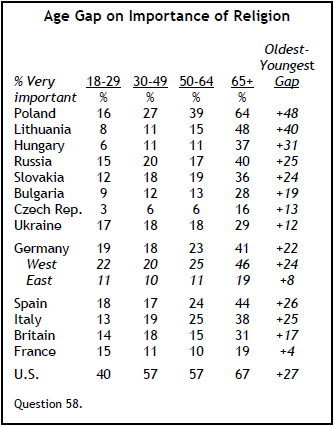 And while most Czechs 65 and older (59%) say they never pray, 87% of those under 30 do not pray. Urban-rural differences in religious commitment are not as pronounced. But in Eastern Europe, in particular, those who live in rural areas are considerably more religious than urban dwellers. This is especially the case in Poland. About four-in-ten Poles in rural areas say religion is very important to them (42%), compared with 28% in urban parts of the country. And while 59% in rural areas report attending religious services at least once a week, just 36% of those in urban centers say the same. Publics in six of the eight former Iron Curtain countries surveyed are satisfied with the extent to which religious institutions play a role in their country’s political life. Majorities in Russia (58%), Lithuania (55%), the Czech Republic (54%), Ukraine (54%) and Slovakia (52%) say churches play about the right role in their country’s politics, as do half of Hungarians. 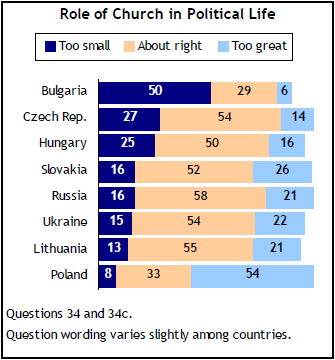 In Bulgaria, however, half say that churches play too small a role in the political life of their country, while 29% say it is about right. This view is shared across demographic groups, although those who have attended college are more likely than those who have not to say that churches play too small a role in Bulgarian politics (59% vs. 47%). By contrast, in Poland, where the Catholic Church’s influence is evident in the country’s strict anti-abortion laws and in its acceptance of religious teaching in public schools, 54% say churches play too great a role in Poland’s political life, while 33% say they play about the right role. 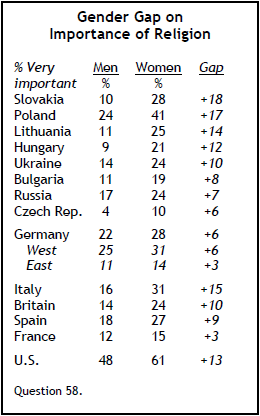 In 1991, more Poles (70%) said churches played too great a role in political life.